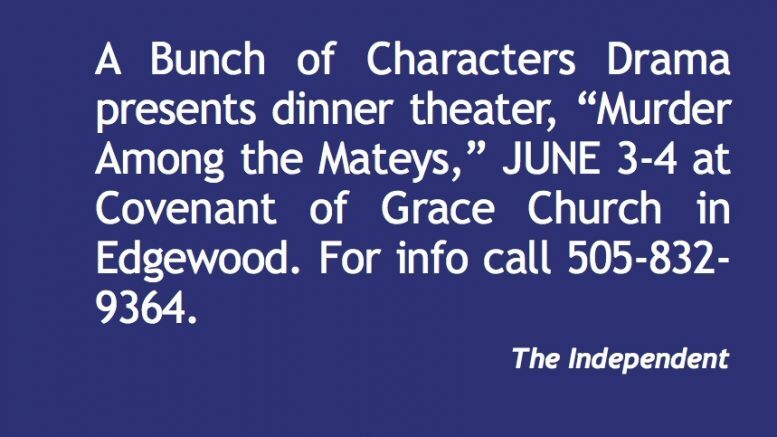 A Bunch of Characters Drama presents dinner theater, “Murder Among the Mateys,” JUNE 3-4 at Covenant of Grace Church in Edgewood. For info call 505-832-9364. Kay’s RV Camp with a Cause, benefits Paws & Stripes, JUNE 3-6 at American RV Park in Albuquerque. For info call 505-220-5796 or visit kaysrv.com. Save Our Pets fundraiser and craft fair, JUNE 4 at 3416 Old Route 66, Moriarty, 9 to 3. Proceeds benefit a local animal shelter. For info call 832-6287. Estancia Mile Long Yard Sale, JUNE 4, set up along Main Street. Free, all vendors welcome. Sponsored by Estancia Masonic Lodge. Manzano High School Mini-Monarch soccer camp JUNE 6-10, 9 a.m.-noon, for boys and girls grades 1-8. Foot skills, ball control and shooting accuracy will be covered. The cost is $60. Registration information is available online at https://mhs-aps-nm.schoolloop.com/girlssoccer. Benefits Counselor Bethel Storehouse JUNE 7, 11 am to 1 pm. Call 832-6642 for info. Mirage Dance Camp JUNE 7-9 from 9 a.m. – 12 p.m. $40. 8:15 a.m. Registration. Hug A Horse Community Day at Walkin N Circles horse rescue, JUNE 11. Open house with music by Cactus Slim & the Goatheads, meet Edge, a rescue horse and hear his tory. Food trucks, music, pony rides, games, bake sale, silent auction and more. For info call 505-286-0779. Sandia MX Series Round 1, JUNE 11-12. For info see sandiamx.com. Jimbo’s live music JUNE 12 and second Sundays, 3 – 6 p.m. at Lazy Lizard in Cedar Crest. For info call 505-281-2313. Free Sewing classes, “Sewing with Jean,” JUNE 13 and second and fourth Mondays at 11 a.m. At Bethel Storehouse in Moriarty. Starts with sewing machine basics, then onto projects. For info call 505-832-6642. Benefits Counselor will be at Tijeras Senior Center Monday, JUNE 13, 10-11:30am, call 286-4220 for info. Blackwater Draw: Mammoths, Bison, and People a lecture by Ethan Ortega on JUNE 14 at 6:30 pm at the Tijeras Pueblo Ranger Station. For info call 505-281-3304. Pintos football camp JUNE 14-16, 9 a.m.-11.a.m., ages 6-12; camp will be on the Pintos football field with a focus on agility with 7-on-7 scrimmages for youngsters. Cost is $20. Mountainside United Methodist Church Upward Sports basketball camp, JUNE 15-16; grades K thru 3, 9 a.m.-noon; grades 4 thru 8, 1 pm-4 p.m.; pre-registration cost is $35, $40 day of camp; lunch provided. Call 281-5117. 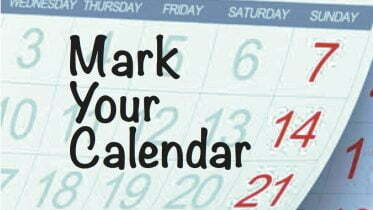 American Legion Post 74 and Auxiliary, meets JUNE 17 or third Fridays, 6 p.m. at the Lions Club in Moriarty. For info, 505-803-9657 or AL74NM@gmail.com. American Legion Riders Chapter 28 will be riding for Bethel Storehouse’s food pantry, JUNE 18 line up at 8:30 at Duke City Harley in Albuquerque. Bring non-perishable food items. For info call 505-832-6642. Co-ed Soccer camp JUNE 21-23 6 p.m.- 7:30 p.m. All ages. $20. Edgewood Middle School. Healthy Foods Market, free produce for registered clients of Bethel Storehouse, JUNE 25, 10 a.m.-1p.m. For info call 505-832-6642. 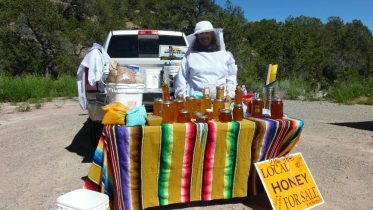 Edgewood 4th of July Field of Arts Festival, JULY 4, 9 a.m. to 3 p.m. For info on booths, call 505-414-1292. Sandia MX Series Round 2, JULY 9-10. For info see sandiamx.com. Lizards, Snakes, and More, presentation by the NM Herpetological Society, 9 a.m. to 1 p.m. at Sandia Mountain Natural History Center, JULY 16. For info call 505-281-5259. Edgewood Music Festival at Wildlife West Nature Park, JULY 28-31. For info call 505-281-7655 or email info@wildlifewest.org. Healthy Foods Market, free produce for registered clients of Bethel Storehouse, JULY 30, 10 a.m.-1p.m. For info call 505-832-6642. Pintos girls soccer camp AUGUST 1-5, 8:30 a.m.-11:30 a.m., grades 7-12. $125. Public Open House at Sandia Mountain Natural History Center, AUGUST 6 from 9 a.m. to 1 p.m., with a wildflower walk at 9 a.m. and an ecology hike at 10 a.m. For info call 505-281-5259. Sandia MX Series Round 3, AUGUST 13-14. For info see sandiamx.com. Mountainair Sunflower Festival, AUGUST 27 from 10 a.m. to 4 p.m. Art, jazz, refreshments, more. Healthy Foods Market, free produce for registered clients of Bethel Storehouse, AUGUST 27, 10 a.m.-1p.m. For info call 505-832-6642. Sandia MX Series Round 4, SEPTEMBER 10-11. For info see sandiamx.com. Sandia MX Series Round 5, OCTOBER 15-16. For info see sandiamx.com.